Quality and innovation has always been our way of business, which has enabled us to serve our clients in the best possible manner. All our products comply with quality standards of NFPA, Fire Bridge, BS, DOT, MMD, ERTL & ISI. Our commitment for excellence and passion for quality products has shown us the way to growth and prosperity. To ensure this, we nurture a separate quality control department wherein our quality auditors and inspectors constantly strive towards achieving in the end products global standards of quality. This team controls & undertakes stringent checking measures to check the production, coating, polishing, performance and packaging operations. Moreover, the quality of raw material is pre-inspected at manufacturer premises so that we can offer quality security products, which stands high on quality and utility. Due to these quality control norms, our array of fire alarm, fire protection, electronics security, surveillance & automation systems has been approved by Korea Govt. and Korea Fire Dept. 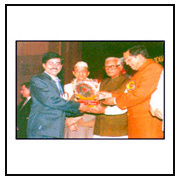 It has also helped us to receive prestigious Rashtra Nirman Ratna Award for being Best Govt Contractor in Year 2002. We are a client-oriented company striving to achieve our ultimate aim of 100% client satisfaction. The hallmark of our company is to provide quality and durable range of fire alarm, fire protection, electronics security, surveillance & automation systems. Further, the capability of our team to deliver them in customized finishes and their competitive prices has also helped us to make many quality conscious clients in the global markets. We have a separate team working on the development of new security products that can provide high functionality. On customer's request, we can also develop customized systems under agreement exclusively for the client according to the requirements, likes and specifications of the customer. In addition, we also welcome and act upon the feedback we receive from our buyers.